Hey there, guys! Here’s hoping your week has been a good one. It’s time for another blog post, and I figured that this week, we’d do a “back to basics” maneuver and review one of the standing desks currently making the market rounds. This week, we’ll be taking a look at the Elevate II Single Surface Standing Desk from Anthro, a company which specializes in the intersection of furniture and technology. At any rate, you guys know what a review is and how they work, so no more dilly-dallying – let’s get started! The Elevate Single Surface Standing Desk is one of Anthro, Inc.’s best-selling pieces of movable furniture. Anthro is a company that does its best to meld the latest technological innovations into its furniture line, and it really shows in the Elevate II’s engineering quality and included suite of features. In fact, you might liken this standing desk to classic Apple’s product philosophy: It only comes in a couple of iterations, but they’re nearly flawless, very expensive, and Anthro’s user base seems to be rabidly devoted to them and their products. There’s no need to take my word for it, though – let’s allow the Elevate II’s features to speak for themselves! The Elevate II adjusts from twenty-seven inches at its lowest point to forty-eight inches at its point of maximum extension. Users can change heights on the fly by pressing a single button; the Elevate II’s whisper-quiet electric motors take care of the rest. This standing desk is capable of supporting and/or lifting up to 150 lbs., making it ideal for both home and office use. Built of sturdy, durable aluminum construction, the Elevate II is built to last. If something does break, a robust warranty ensures rapid, hassle-free repairs. 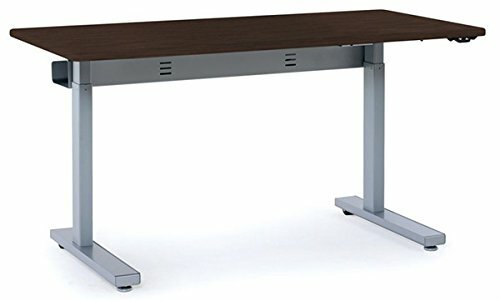 This standing desk is available in two width / depth combos (48″ / 23 1/4″ and 60″ / 29″ for small and large sizes, respectively), and comes in a variety of color options. Wheels mounted on the rear feet of the Elevate II make it easy to move this desk around if you need to, even if you have to do it alone. An integrated cable management system and beveled, comfort-focused edges make it easy to focus on work instead of nitpicking over worrisome design flaws. The Elevate II Single Surface Standing Desk is designed to accommodate a variety of modular peripherals, including things like articulated monitor mounts / extenders, racks for your CPU tower(s), power surge protectors and device hubs, and more. While Anthro’s Elevate II is clearly designed to be the last standing desk its users will want or need for quite a while, it isn’t perfect. Like any machine, it comes with its fair share of pros and cons, which ironically enough, often stem from Anthro’s attempt to make it the perfect piece of kit by stuffing it with all the features listed above. Let’s take a look – keep reading for a breakdown of the Elevate II Single Surface Standing Desk pros & cons. The Elevate II’s ability to support / lift 150 lbs. is a godsend for busy office environments. Projectors, multiple PCs, stacks of portfolios or other papers – with technology getting smaller and sleeker each year, there isn’t much you can’t cram onto this desk with a limit like that. Anthro’s warranty program is great for what it is. It does have a hiccup or two (more on that in the “Cons” section), but if something breaks, you can count on Anthro to fix it ASAP, as long as it’s covered, of course. There’s no need to worry about annoying operational noises with this standing desk. Even with an entire office full of them, the Elevate II’s electric motors will probably make less noise than the break room coffeemaker. With varied color and size options, finding an attractive look and fit for your new standing desk should be a breeze, no matter what your aesthetic preferences or work-related needs. Integrated cable management is just a nice little cherry on top of a desk like this. Combine this with a treadmill like the LifeSpan TR1200-DT3 to create a great treadmill desk. Assembly is annoying, speaking both in terms of the process itself and with regard to its sheer necessity. Naturally mechanical folks who buy this standing desk probably won’t mind putting it together. Truth be told, it shouldn’t take long even for the average consumer. Still, at the price point Anthro has set for this desk, it ought to come at least partially assembled. At its core, the Elevate II is more table than desk. You’ll need to buy a handful of accessories – power / USB hubs, modular racks, monitor arms and so forth – to really get the most out of it, and they’re all sold separately. It is worth noting, though, that you can get along without them if you want. It’ll just make your user experience a bit less streamlined and fun than it might otherwise be if you choose to go ahead and buy them. Remember the hiccups with regard to Anthro’s Elevate II warranty program that I mentioned in the “Pros” section? Well, it’s time to catalog them. For a start, the lifetime warranty only covers the table portion of this standing desk; it’s unclear whether Anthro’s definition of “table” extends to the legs / metal components. Further, while there’s a five year warranty on all the electrical bits – maybe this is what covers the legs and their enclosed motors? – cords, plugs, and other miscellaneous power supply items aren’t covered at all. Overall, the warranty program could use some refinement. The Elevate II is electrically driven. If you want to use it as a standing desk, you’re going to need a steady supply of reliable juice. It has to be said that the machine works great while the power is flowing, but if it goes out for some reason, you’ll be stuck with whatever height setting you were using until things get back to normal. Well guys, there you have it – a review of the Elevate II from Anthro. Hopefully you’ve got a better idea of what this desk is capable of, where it excels, and where it could use some improvement. Whether you end up buying one or not, standing desks are constantly evolving, so it should be quite interesting to see what the techs at Anthro come up with next.